Ash is commonly used in the furniture market. 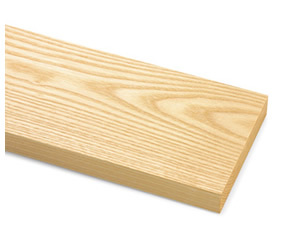 Ash is a long-fibered, light-colored, medium-density wood that grows in the United States and Canada. It is coarse, porous grain is similar to that of oak, but it varies from white to light-red in color. Hard and heavy enough to be used for baseball bats, it’s also flexible enough for bending. Ash takes stain well and is used mainly for chairs and stools.